This form is to register if attending our Mountain State Soccer Club and Marion Futbol team try outs for our Winter Futsal and Soccer Season and/or Spring Season. Registering with this form is only to attend our try outs. Our Winter Futsal and Soccer Season will start Week after Thanksgiving and run through March 1st. Our Spring Season will start in March and run through June. **All players that play for MSSC/MFC will be eligible to play for our EMPIRE state cup and Showcase teams. MSSC/MFC Try outs in Fairmont! Winter Futsal/Soccer and Spring 2018-19!! Tuesday November 6th and 13th u9/u10 Boys/Girls 5:45-7pm and u11/u12 Boys/Girls 7:15-8:30pm. Wednesday November 7th and 14th u13/14 Girls 5:45-7:15pm and u13/14 Boys 7:30-9pm. Thursday November 8th and 15th U15/u16 Girls 5:45-7:15pm and u17/u18/u19 Girls 7:30-9pm. Friday November 9th and 16th u15-u16 Boys 5:45-7:15pm and u17/u18/u19 Boys 7:30-9pm. Empire Winter MSSC/MFC will comprise both Indoor Soccer and FUTSAL which will start in November after Thanksgiving and run through March. We will practice two times a week and attend futsal and Indoor soccer tournaments. We will also look to compete in the Regional tournament for US youth Futsal. Empire Spring MSSC/MFC will look to field different level of competitive teams in all different ages. We will look to field 3 teams for each age group ages u9,u10, u11 and u12 which includes Two premier teams and One Classic team per age group with the Classic teams competing at a higher level. 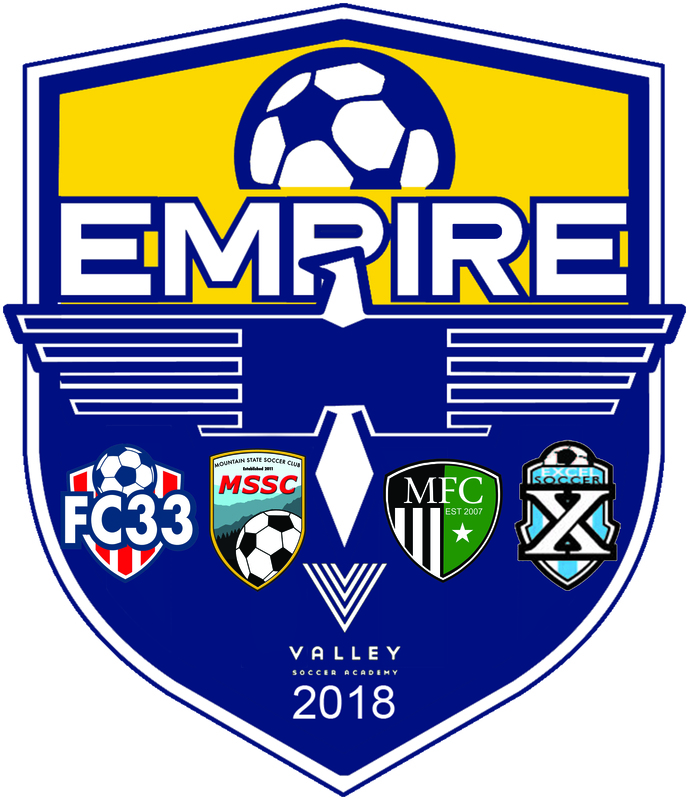 The Empire FC State Cup Teams comprised of MSSC/MFC and FC33 clubs Calendar of Showcase events and WV State Cup 2019!! *Do not forget if you play for MSSC/MFC or FC33 you are eligible to be placed on our Select State cup and showcase teams! What to Bring to our try-out? Dark Colored Jacket,White T-shirt or Grey, Soccer Attire and Sports drink/water.